The Key of Rescue- William Rodriguez, The Latin face of 9/11 Special Series. 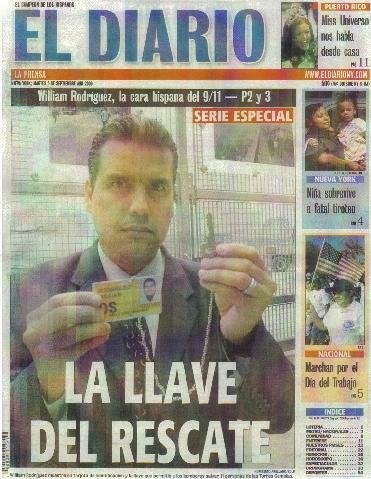 William Rodriguez, last man out of the North Tower and key activist for the rights of the victims of 9/11, was portrayed on the cover story of El Diario. With a 3 page article, El Diario presented the fight and expectations of William Rodriguez, those themes includes his rescue effort on 9/11, the search for the truth and his political strategy in case if he decides to run for office. Rodriguez's story, well known in Latin America and all over the world, has been mainly suppressed in the USA. His followers are pushing him to run for elective office but he says that he is to busy bringing his mission all over the world. On the article, the reporter noted how he has been fielding interviews from all over the globe and expect to reach an audience of more than 300 million people in televised and live presentations on the 9/11 Anniversary. Also this Thursday, he will be appearing on a TV special on Univision Network top rated news magazine " Aqui y ahora" ( Here and Now- 30 million viewers) at 10pm. He will talk about his views on what really happened on 9/11 and a panel of government expert will be interviewed to contradict his experiences. Thanks William for the heads up! This entry is in need of editing though - several spelling and grammar errors. YT on Wed, 09/06/2006 - 10:57pm. Anyway, what the hell is this supposed to mean? ...and a panel of government expert will be interviewed to contradict his experiences. MediaPuppet (not verified) on Wed, 09/06/2006 - 11:04pm. Anonymous (not verified) on Thu, 09/07/2006 - 10:33am. LOL!!! Thanks for that sudden levity, Anonymous. FrankV (not verified) on Thu, 09/07/2006 - 11:56am. Tonya on Wed, 09/06/2006 - 11:01pm. and a panel of government expert will be interviewed to contradict his experiences.? the same govt experts who refuse to face the st911s including prof. wood in a debate? rodriguez was hailed by the mcmedia as a hero - how long will it take before the same mcmedia starts slandering him? james ha (not verified) on Thu, 09/07/2006 - 12:46am. I have nothing bad to say about this coverage or about William. But one thing that angers, no, frustrates me, is that William recieves so much mainstream coverage in only non-english speaking media. Whether that be in the U.S. or abroad. In my opinion, what is really needed, is a LOT of english speaking mainstream media coverage of William in the U.S. -- and fast. - Ø®£Z - on Thu, 09/07/2006 - 1:04am. Maybe because hispanic TV isn't controlled by Zionists? Just a guess. Anonymous (not verified) on Thu, 09/07/2006 - 10:37am. International recognition of 9/11 truth is absolutely crucial. The U.N. needs to recognize the U.S. for what it is, and recognize the accusations from leader like Chavez and Ahmajenidad as not mere rantings of lunatics. Then the mainstream media will have a much harder time ignoring it. Plus we haven't heard the MM spout off about our evil international allies (like the French) for a few years now. Can you imagine: Boycott all international products rally call. So much more fun than 10 year old murder cases, I might even start to watch TV news other than Olbermann again (except abc and fox of course). BTW, anyone know how to block a regular cable station like abc from coming in. Then we could all block it and write to their advertisers about government run propaganda stations. Anonymous (not verified) on Thu, 09/07/2006 - 10:49am. Anonymous (not verified) on Thu, 09/07/2006 - 2:09am. Hey! Had a great show tonight with a bunch of members of San Diegans for 9/11 Truth! check out the show, it was really excellent. Al (not verified) on Thu, 09/07/2006 - 2:33am. Apparently those who question the official story of 9/11 are said to be helping "the enemey". truthsearching2006 on Thu, 09/07/2006 - 5:52am. its a very clear warning. we should be wary. it was only a matter of time before people like us became to loud to ignore. why not criminalize us? Chris on Thu, 09/07/2006 - 7:47am. How far with the NeoCons go in their evil? It makes you wonder how far the NeoCons will go in their effort to hide the real criminal activity behind 9/11 and in their promotion of fascism in the name of security, liberty, and freedom? They have declared an all-out war on thinking, questioning people who refuse to submit to the media's brainwashing complicity in understanding true history. They demand you believe the official 9/11 story or else. What will the "else" eventually be? truthsearching2006 on Thu, 09/07/2006 - 8:29am. Rumsfeld warned that the terrorists would be "winning the propaganda war on the internet", and that the govt. has to do more to counter it. - It becomes more and more clear who he meant by "terrorist propaganda" on the internet: not al-Qaeda, but 9/11 truth! Greg (not verified) on Thu, 09/07/2006 - 10:43am. Only took him 3 years to speak up. Tell us about how you "saw" the airplane from 5 floors undergraound Will! brianv on Thu, 09/07/2006 - 8:16am. Some folks are taking cheap shots at Rodriguez. sold out and would have been set for life. Instead, he is speaking about the events as he understands them. You ought to take some time to listen. Obviously, thus far many have not. People if you have not watched The Money Masters. Part 2 - How International Bankers Gain Control Of America. funkyblues (not verified) on Thu, 09/07/2006 - 9:00am. Jon Gold on Thu, 09/07/2006 - 9:02am. He never said, he saw or heard any plane coming in. Recently he spoke out against Jimmy Walter who is supporting the findings on 9/11 TV Fakery. Rodriguez himself thinks, that some airplane parts he saw do speak against the evidence of doctored live footage. ewing2001 on Thu, 09/07/2006 - 9:59am. For your info: Polish weekly magazine "Przekroj"
("Cross section") publishes article about 9/11 Truth. They've added DVD "Press for Truth" to the edition!!! They start with description of the Truth movement, underlining it emergence from the Internet. Then they swift attention to the Pentagon crash (they mention that still, some belive that Boeing might hit the Pentagon, but wonder why it wasn't shot down). Then Mineta Report is taken under close look. They also cover the interview by Goyette with Popular Mechanics' guy. They mention less probable theories (no plane, pod, 4000 Jews...). "Without Precedent: The Inside Story of the 9/11 Commission” is described. Well this is more or less a kind of article I wanted to read. Pity that they do not mention controlled demolition, therimate and Steven Jones. salvi (not verified) on Thu, 09/07/2006 - 8:21am. Jon Gold on Thu, 09/07/2006 - 8:59am. I'm extremely impressed with William Rodriguez!!! I'm extremely impressed with William Rodriguez!!! He is doing a fantastic job in spreading the truth!!! Anonymous (not verified) on Thu, 09/07/2006 - 9:08am. He will be tonight on a Hispanic Television program called Aqui y Ahora (Here & Now, Univision TV) for the hispanic viewers and for those who speak spanish!!! In the previews they were talking about a possible government involment in the attacks!!! JUanV (not verified) on Thu, 09/07/2006 - 9:42am. i dont understand spanish one bit, but im damn sure gonna watch this anyway. your the man William, thanks for your bravery. Chris on Thu, 09/07/2006 - 10:45am. I think Spanish is the third most populous speaking language on the planet. I think 400-500 million people speak Spanish. If Rodriguez can reach that group without the interference of the mass media then this is an absolute coup. This is 7-8% of the world's population. And think about all the Latinos in the Southern USA who are going to hear it. And a lot of them speak English. AND what about other newspapers in the world. Like the Russian newspapers and the Brazilian newspapers and the Chinese newspapers and the Muslim newspapers. That would be half the world's population. Soon the whole world would know. Americans would hear 911 truth from the rest of the world. We can't get the truth from our newspapers so lets go around them. We are just for telling the truth. We want the truth out. Anonymous (not verified) on Thu, 09/07/2006 - 12:54pm. Since when is Rod MIHOP? Correct me please, if I'm mistaken, but isn't Rodriguez a firmly ensconced LIHOP apologist? Fully on-board the al-Qaeda bandwagon, and all ready to lambaste Bush for his "incompetance" and "failure in protecting America"? I beleiev I had read somewhere that his whole approach to the basement bombs was to suggest that "al-Qaeda" had planted explosives, prior to the plane hijackings. If so, there goes a big chunk of your CD theories, cleverly discarded in the "national media" we're hoping this guy soon appears in. Herr Pi on Thu, 09/07/2006 - 1:13pm. I just got a forwarded email from Phil Berg indicating that Rodriguez has withdrawn from his RICO suit against Bush, Cheney, et al. This is clearly his personal business, however, due to statute of limitations issues, Berg now has until MONDAY to find another plaintiff. against Bush, Cheney and 54 other defendants to be withdrawn. murder, there should be no limitation on our RICO case re 911. I need a plaintiff to file a new law suit on Monday, 9/11/06. I am speaking with several people. member that lost a loved one, that was also lost their business. Second, I am looking for one that was injured and lost their job. casseia on Thu, 09/07/2006 - 1:33pm. From what I understand he may be just looking for new representation. Hopefully that is all it is. Tonya on Thu, 09/07/2006 - 2:19pm. How can you contradict what a person has seen and experienced. A desperate government that murdered 3000 of our citizens of course will try anything. John Normanton (not verified) on Thu, 09/07/2006 - 6:25pm. Hi all!!! William Rodriguez here! looks uninformed of not knowing my position and all I have done in the last 5 years as an activist. The article above, was indeed machine translated by a volunteer and sent out from my system, sorry for the errors. With the worlwide attention I have been receiveing, I could destroy many of the detractors and their theories but I always talk about my experience and that should be strong enough than to speculate on CT's. I have had access to top goverment whistleblowers and believe we are close to the truth and "they " are very nervous indeed. So I expect, infiltrators, detractors and accusers to increase their tirade in the next couple of days. For those who have supported me, Tonya, John, DZ, and others, THANKS!!! I do indeed read your comments whenever I can and even though I do not respond to everything... I am aware of who's who. About the RICO suit. I did dismiss Berg for personal reasons and pulled out from the suit. I am working on something bigger and more explosive and with the backup of a team of pro-bono lawyers. See the latest Press conferences and news (those in NY knows!!) about the health issues and the nervous legislations being approved by both, the City and the State, to have an idea of what I am talking about. I cannot humanly post all I am doing since it is time consuming and even though I am tireless on this search, there is not enough free time. I need help, I need volunteers on all levels of expertise to help me, I need financial support to continue as well since I became "unenployable" because of my position, mission and future plans. All the best to all of you and God bless us all. PS- here are the interviews of the last 3 days only!!! William Rodriguez (not verified) on Thu, 09/07/2006 - 8:41pm. better, court action than the rico suit. you get to be a hero and save the planet! RANDKILLER999999 on Thu, 09/07/2006 - 8:47pm. thank you William! you are a brave man. any movement on the Venezuela stuff? keep up the good work man. Chris on Fri, 09/08/2006 - 8:59am. My son and I sat and listened to him and his interview on Univision. This is a big deal, because the audience is quite large and pretty faithful. My son was amazed at the pointed questions, and the fact that Mr. Rodriguez was given leeway to speak freely. They, of course, offered the "official" version, down to diagrams and all, and in my opinion, didn't cover the anomalies as thoroughly as they did the OV, but the fact that he (and my son believes William is the key to exploding the official myth) was allowed on a network to describe his experience on 9/11 is a huge step in the right direction. Anonymous (not verified) on Fri, 09/08/2006 - 9:34am. I'm so proud to know that a "boricua" like me is doing such an incredible job. I want to thank you on behalf of all puertorricans. Mostly I want to thank your mother for raising up such an amazing human being. Please take care and God bless you. Que el angel de la guarda te cuide siempre. Un abrazo. Carmen (not verified) on Wed, 09/13/2006 - 11:11am.